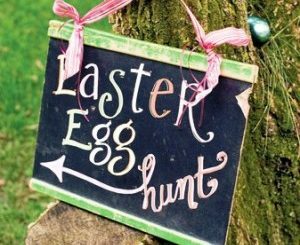 Easter Egg Hunts 2019 in Savannah, Pooler, Richmond Hill, Bloomingdale, Hilton Head Is. 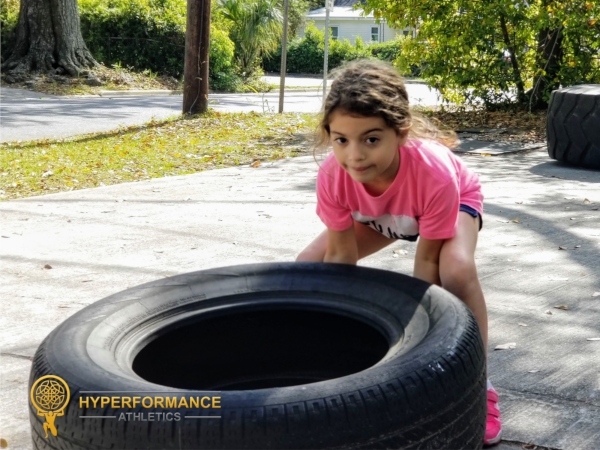 Young athletes may not have found their sport of choice yet, but through Hyperformance Youth they are laying the foundation to be faster, quicker, and more aware of how their bodies are moving through space. Hyperformance Athletics’ youth program begins with student in or entering 1st grade or older. In class, they learn how to perform basic movements like squats, pushups, and hanging. Then they challenge themselves with obstacle courses, rope climbs, relay races, and workouts. At the end of class they play a game to utilize new skills and remind them that fitness is fun. Join Hyperformance Athletics in Savannah this Saturday April 6 2019 at 10:15AM for a free trial class and see what all the Hype is about. Wouldn’t it be amazing if you always did healthy things all the time without even thinking about it? That’s the beauty of a habit. It just happens without a whole lot of resistance. We’ll got habits – the routine things we do from the moment we wake up to the moment we go to sleep (even the way we sleep is a routine). Our kids have habits too. Some are great, and some we wish as parents we could break before it gets harder later in life. One thing at time. Don’t try to pile on multiple new habits at once. That’s a recipe for failure. Pair the habit with something you already do routinely. For instance, if you’ve decided that you should drink more water, connect it with something you already do. Perhaps when you turn the water on to take a shower in the morning, it triggers you to go snag a quick drink as you wait for the shower to warm up. Chunk it down. Reduce resistance to getting started by setting a goal in the smallest increment possible. If getting more activity during the day is a goal, you’re not likely to stop your other habits to work in 30 minutes. But if you can work in 1 minute a couple of times a day you’ll find you are getting in much more than that one minute. Getting started is the hardest part. Reward yourself (with something healthy of course, but enjoyable). My kids don’t love to read, but they like their time with me. So we read for a bit and then they get some bonus attention that is just theirs. Take notice. You want your kids to pick up after themselves? Verbally applaud them for doing the task as soon as notice it getting even a tiny bit better. Progress is better than perfection. Our habits are always a work in progress. Keep looking for news ways to make doing the good stuff easier. Want more ideas? 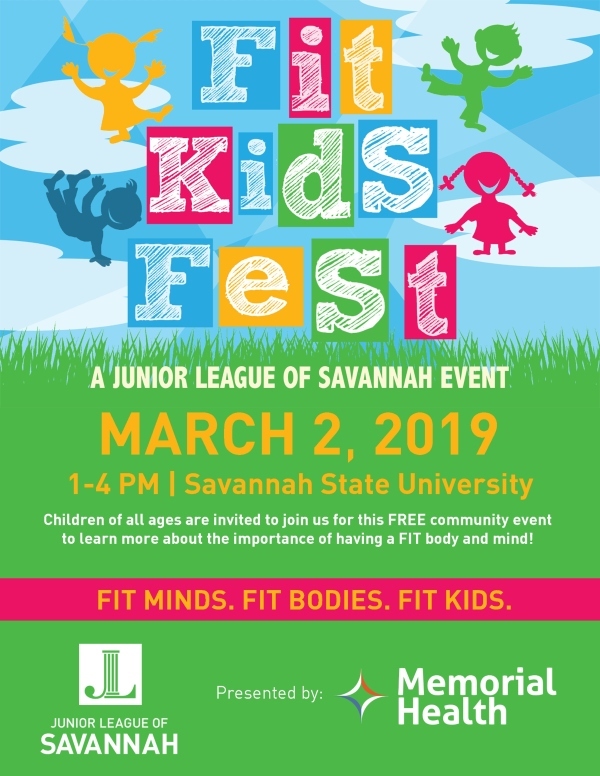 Check out the the Junior League of Savannah’s FREE Fit Kids Fest on Sat. March 2 2019, 1-4PM @ Savannah State University. 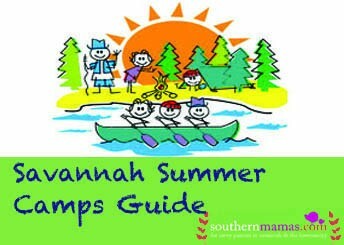 There will all sorts of activities and local vendors that love to make Savannah families healthier. Stop by the Hyperformance Athletics Obstacle Course and say hello. This one is for the Moms AND Dads! Hyperformance Athletics in Savannah knows that time after work is precious when you have a family. Especially when kids’ sports, music lessons, homework, and dinner begin chipping into that time for just you. Hyperformance Athletics is excited to announce an ALL NEW 30 minute functional movement class during the lunchtime hour. Come on Wednesdays and Fridays from 12:30-1PM for SWEAT:30. You’ll never be bored, and can easily ramp up or down the intensity to suit your needs. Get in and out for a more productive afternoon and all important family time in the evening. Now through the end of December you can take one SWEAT:30 class for free. No other experience required. Just come about 10 minutes before class starts to get settled in. Questions? Call 912-335-3615. Hyperformance Youth Kids Program in Savannah helps kids connect fitness with fun. 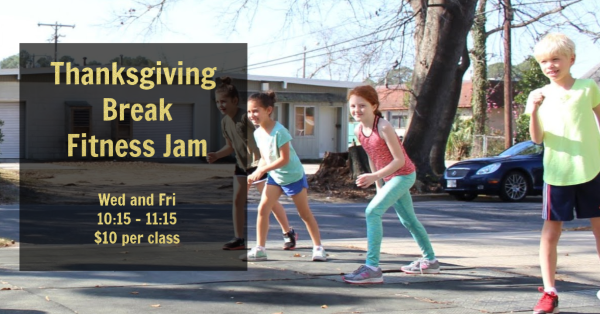 Join Hyperformance Athletics this Thanksgiving break 2018 for 2 Special Kids Classes. Exposing kids to multiple sports, both individual and team based, are an important part of growing up. Not to mention kids connect movement with fun and success. Make that connection when they are young and your children are much more likely to enjoy a healthy, active adulthood. Hyperformance Athletics in Savannah offers the foundation of that success. Their program for elementary-aged kids exposes them to new physical challenges each session. Those challenges present opportunities to grow in character and in fitness. New students are invited to join us for a free trial class any Wednesday at 4:30PM or any Saturday at 10:15AM (no class Saturday 10/26) at Hyperformance Athletics, 904 E 70th St. 912-335-3515. Learn more about the kids classes here. CrossFit Hyperformance in Savannah will have a free community event 8AM-3PM this Sat. Sept. 22 in celebration of their 10 year anniversary, bringing in multiple health and wellness experts from different fields to give free workshops and seminars. Classes include yoga, low-impact, speed and agility training, gymnastics strength, striking, running technique, and self-defense. Seminars include stress management, 50 is the new 30 Masters Panel, Winning the Mental Battle, Nutrition for real life, and meal prep strategies. 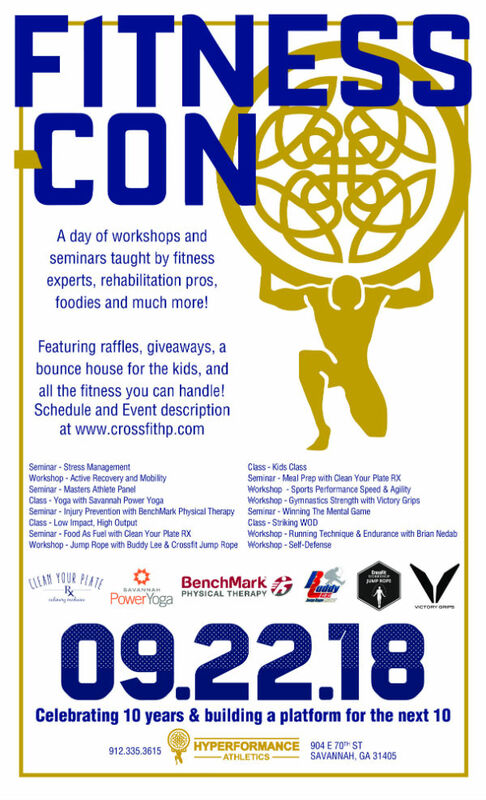 The schedule of events is available at crossfithp.com and all classes are free and open. 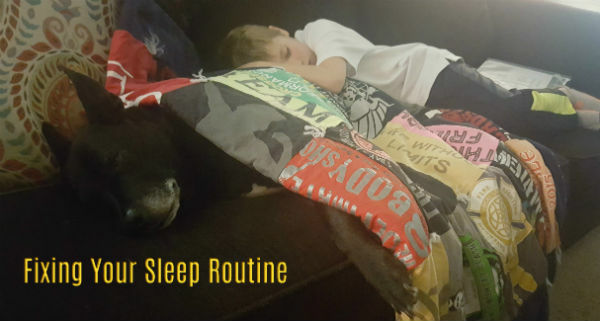 This month at Hyperformance Kids we’re showing off our sleep routines! We’re talking about the benefits of a good night sleep and how having a routine can help. The better you sleep the better you feel. Sleep is also imperative to maximize learning. Our brains processes both new physical tasks (like coordination) and information during sleep. Your body’s recovery processes and growth hormone release are heightened during deeper stages of sleep. 1.) Cut off overhead lights at dusk. As it gets darker outside, cut back on the brightness inside too. It signals their bodies to start winding down. My boys love lighting candles and dimming the lights. 2.) Cut off devices and screens at least 30 minutes before bedtime. In the summertime I like to take a walk outside in the natural changing light with my boys. They are also less tempted to go back to the screen. 3.) Reflect. Our family has “couch time”. Each person gets a minute to talk about the best part of their day. It forces us to stop what we are doing and just be together for a couple of precious minutes. 4.) Prep the next day. Not just laying out clothes and making lunch, but ask your kids what they are looking forward to the next day. They will start to connect the things they want to do with a desire to feel ready and well-rested for it. Of course, lots of exercise and time outdoors during the day helps too! And nothing is wrong with a little power nap from time to time either. This Sat. Aug. 4 2018 is FREE First Saturday Friend Fest at Crossfit Hyperformance Athletics in Savannah. You are invited to sweat and laugh with Cross Hyperformance for free this Saturday morning at 9AM at Hyperformance Athletics. All fitness levels are welcome and Crossfit would love to see you there! Saturday July 7 2018 is FREE First Saturday Friend Fest at Crossfit Hyperformance Athletics in Savannah. All kids love to jump – up, down, and sideways. (Maybe off of something we as a parents would wish they wouldn’t). Did you know that when it comes to skeletal development jumping is very important? Actually, the landing is even more important. When you land, a wave of impact is sent through the skeleton that signals bone cells to lay down more mineral deposit making them denser. Bones react according to the forces put on them. Between the ages of 12-14 years old bone density is increasing at its fastest. That is a huge window of opportunity for pre-pubescent children to have a positive effect that will linger well into adulthood. To get the most benefit, the speed of loading (such as in jumping or bounding) is more important than slow or static loading (standing, walking, weightlifting). 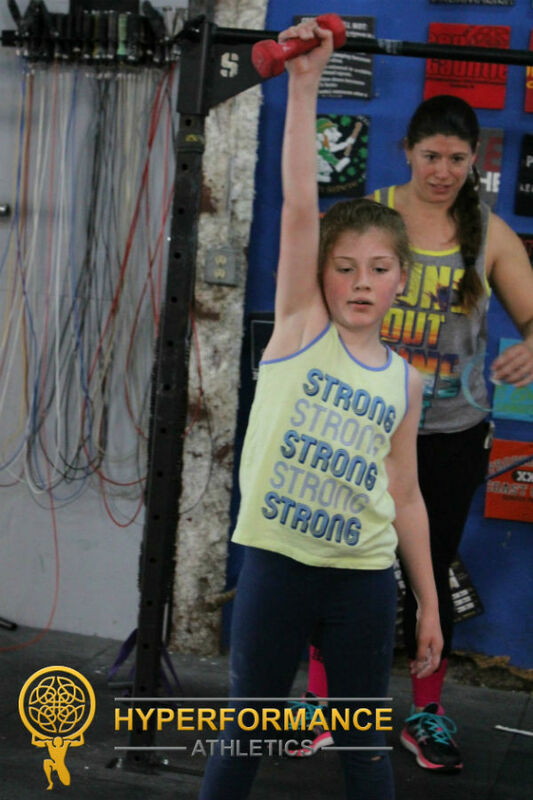 We call this rapid force changing impact loading – and it’s a part of every Crossfit Kids class. No external load needed; these activities are self-scaled by ability to reduce the risk of injury. Impact loading activities are a priority for all age groups within Hyperformance Youth programs, for the benefits they provide the growing skeleton as well as the improvements they bring about in such physical skills as power, speed, and strength. What’s better than a free workout on Saturday morning? A FREE Workout + Tacos! It’s Cinco de Mayo AND First Saturday Friend Fest at Crossfit Hyperformance Athletics in Savannah. Join Crossfit Hyperformance Athletics, Savannah this Saturday at 9AM for the classic First Saturday Friend Fest workout. Bring a friend or come make a new one. 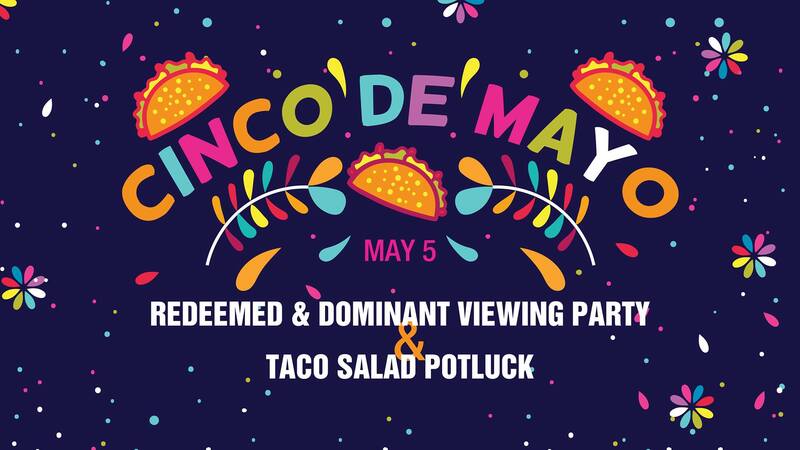 Then stay for taco salad bar and a viewing of the movie Redeemed and Dominant (a Crossfit Games documentary). If you stay for the movie, make sure to bring a lawn chair or something comfy to sit in. It’s called Exercise Deficit Disorder. And it’s a problem, especially for our children. Changes in our lifestyle over the last few generations (consuming more high calorie, low nutrient food and moving less) are the primary cause of increased obesity rates in our kids. It’s far more than genetic. And it’s not slowing down anytime soon. Sedentary behavior is contributing to the decline of health indicators in children and adults, with behavior patterns beginning to emerge as soon as age 6 and worsening into adulthood. The shift in activity pattern has now been coined “Exercise Deficit Disorder”. We believe that being healthy is more than having good physical markers. It’s also having the ability to learn new things, focus, control emotions, make friends, and feel generally happy. As parents, we want our kids to be healthy in mind and body. 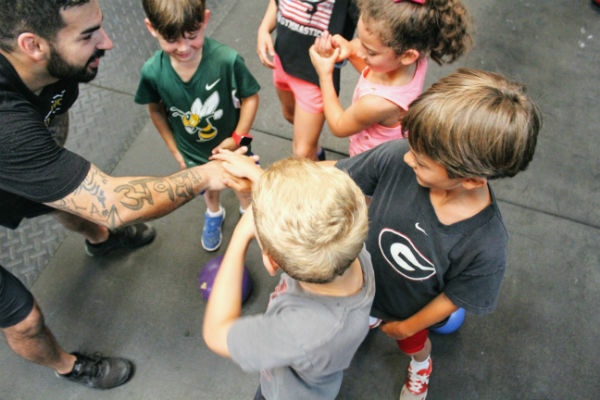 The youth program at Crossfit Hyperformance Athletics in Savannah specifically addresses these issues. As a Crossfit Kids Affiliate, “The program is comprised of elements designed to reduce Exercise Deficit Disorder and poor lifestyle choices: laying the foundational movement patterns, providing children with a portion of the prescribed amount of exercise for the week, improving muscular and cardiovascular fitness, discussing the roles of food, and providing endless opportunities for success – all while keeping the class and it’s information fun and engaging.” From Crossfit Kids Training Guide. The purpose of the Hyperformance Youth program is to attack the prevalence of Exercise Deficit Disorder. Classes for rising 1st through 5th grade students happen every Wednesday at 3:30PM and Saturday at 10:15AM. Join Crossfit Hyperformance Athletics in Savannah for a free trial class today. Email jen@crossfithp.com or call 912-335-3615. Family Is To Fitness as…. Peas are to Carrots? Peanut butter is to Jelly? Family and Fitness just go together. 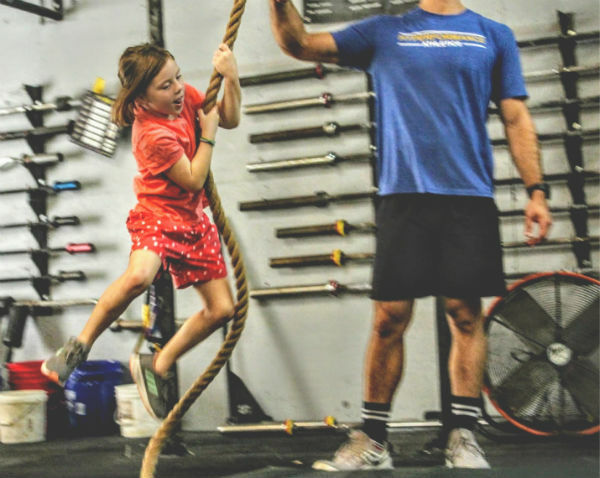 Without a doubt, Crossfit Hyperformance Athletics in Savannah clients that have been the most successful in their fitness endeavors for the long term are those who involve their entire family. Have meaningful conversations around fitness and food. Create opportunities to set, reach, and celebrate goals. Create bonds and memories that last. Pair being fit with having fun. 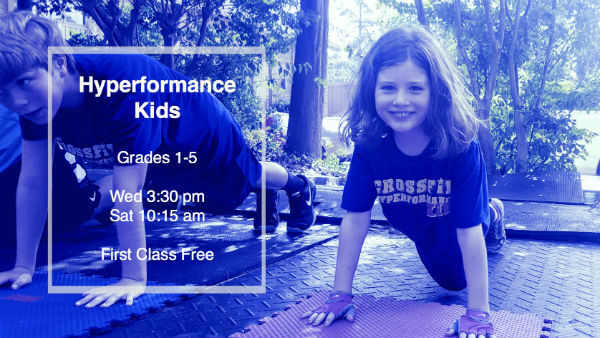 Join Crossfit Hyperformance Athletics in Savannah for a free trial kids class this week! For details email jen@crossfithp.com or call 912-335-3615. We see it everyday. Folks ready to get back in shape, wanting to tone up and have more energy. Parents wanting to be a healthy role model for their kids. As a gym owner – I want that for you too! But what many people do not realize is that before you can get fit – you’ve gotta get healthy. Being healthy is way more than breaking a sweat a few times a week, although that’s parts of it. Healthy means much more than looking leaner and seeing some muscle. It’s the ability to participate in fully in life, deal with stress, and fight illness. If you rely on medications to make it through the day, you are not healthy. If you need to have a glass of wine or sleep aid to fall asleep, you are not healthy. If you rely on an energy drink at 2pm, that is not healthy either. Health and fitness are part of the same continuum. Once you are healthy – it’s easy to keep doing the same things to get fit. How do we help people get there? Practice the OTHER habits too. Starting THIS Saturday, Jan. 20 2018, we’ll be practicing these habits for 6 weeks as a team. 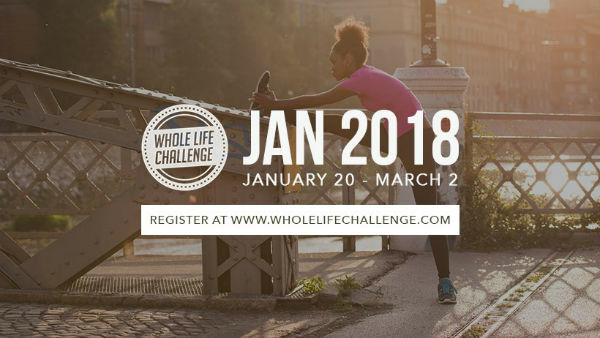 It’s called the Whole Life Challenge and we welcome anyone that wants to dive into these habits to join us. We kickoff the Challenge at 10am Sat. Jan. 20. Want more information on getting your family happier and healthier? Visit crossfithyperformance.com for more information. 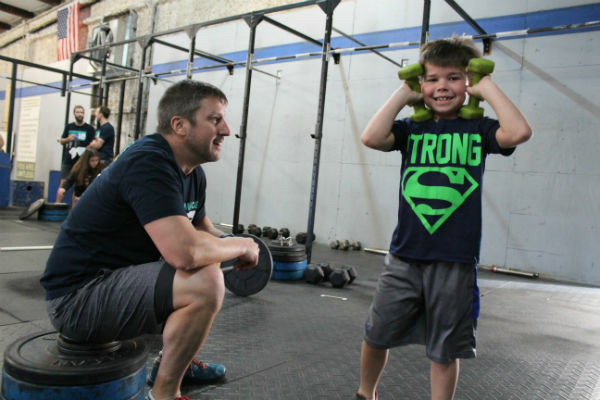 Crossfit Hyperformance Athletics in Savannah offers fitness classes for kids as well as adults. Kids classes @ Crossfit Hyperformance Athletics in Savannah . FIRST CLASS IS FREE. Grades 1-5: Wednesdays from 3:30-4PM and Saturdays 10:15-10:45AM. New kids are welcome to come try their first class for free. Adults are welcome to schedule a free one-on-one coaching appointment. For questions call 912-335-3615 or visit online at www.crossfithp.com. With everyone in back-to-school mode, it’s a great opportunity for Mom and Dad to get back into the groove as well. Crossfit Hyperformance Athletics in Savannah has got some advice on getting that done. Crossfit Hyperformance has a power word to help you transform your habits. But wait! Before you jump back into the same old stuff, take a minute and consider how some of the routines you have now are helping or hurting you. You are what you routinely do. READ THIS ENTIRE POST HERE. Any new kids participant is welcome to come try their first class for free. Adults are welcome to schedule a free one-on-one coaching appointment. Early this week, Hyperformance Athletics owner and Crossfit coach Jennifer McKenzie, MS opened her computer to find YouTube videos on how to make the world’s biggest gummy worm. That was after the Eventubehd jelly bean tasting challenge and 100 layer Airheads challenge. As every parent has, Jennifer worries about the messages her two two wild boys (ages 9 and 6) absorb from the world around them. Not just in regards to health and fitness, but about character too. Jennifer wants them to confident, capable, AND healthy. With all our good intentions to have kids move more, the iPad still reigns king as the entertainment option of (their) choice. More than ever there are conflicting nutrition messages from the media and pseudo-experts. We want so bad to be good example for our kids but still the pace of life is keeping us from being healthy ourselves. Parents, this month Jennifer wants to issue you a simple challenge. Analyze who influences you. You become like the people you hang around the most. We all want to be better for our children. So who is influencing us? Imagine yourself at work (if you are there just have a look around). Are the people around you ones that you admire? Are they the type of people you introduce your kids to and want them to hang around with? Do they tell you the truth (especially when it’s hard and you don’t want to hear it)? Do they roll their eyes every time you make a healthy choice, or worse make you feel bad for it? Are they in your corner? Are they where you want to be? What habits have you picked up at work? How about at home? Does your family rally behind you when you? Of course they say they want to see you happy and healthy, but are they willing to go on that journey with you? It’s OKAY if you answered no. Jennifer is not suggesting that you quit your job or leave your family. Quite the contrary! You could become the best thing that’s ever happened to them! However, if becoming healthier is your goal, and you hope to carry that on to your family, find a way to balance those influences with positive people that are where you want to be. Have people in your corner who are willing to struggle with you, and will genuinely celebrate your success. Add people that you can emulate. If you pick up their habits you are better for it. Add people with character traits you wish to have. One of the most fun things they do at Hyperformance Athletics is introduce their athletes to each other. Hyperformance Athletics is a catalyst for building community through challenges, events, and in the structure of class every day. 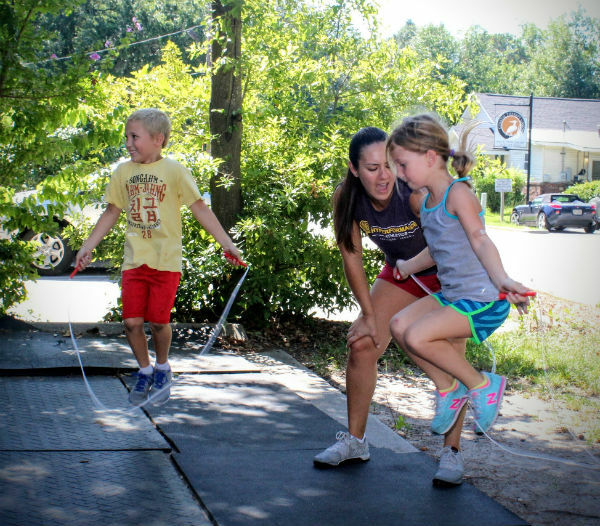 Kids look up to our coaches, who make fitness fun and rewarding. Hyperformance Athletics coaches would love to give you a dose of inspiration and sweat at a free adult class on August 5 2017 at 9AM and kids class immediately following at 10:15AM.